Haksai, or Chinese cabbage was just finishing up, and it seemed like a logical use for the extra heads in the Takashi's field. We peeled, cored, and sliced twelve heads, and then worked them over with a sprinkling of salt. The salt on the cabbage caused it to almost immediately wilt and release water. We continued adding cabbage and salt and massaging with our hands until the bowl in question was well full of wilted cabbage and frothy brine. (The froth resulted from all the air that was being worked in.) We transferred it to a larger container for holding while getting ready to massage the next round. 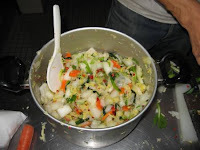 We then mixed the spicy stuff with the salted cabbage sinking our arms in to above the elbow to work the mass. We turned and turned that mass for a good half an hour. 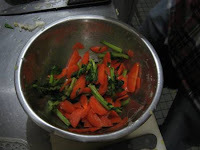 Once our skin was super tingly, the vegetables looked well mixed, and there was plenty of brine it was declared done. 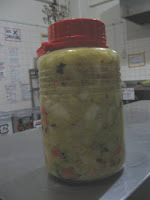 We let our jar ferment for about four or five days before eating, and are enjoying it still. Note: We didn't add dashi or fish product of any kind, although many recipes call for it. This recipe approximates what we did (leave out the sugar, though), and should give a pretty good idea of ratios and techniques. If kimchi seems a bit intimidating, try these quick Japanese cabbage pickles. Only a little spice, and they're ready in moments to augment any meal perfectly. Japan has a long history of eating fermented foods - from natto to a wide variety of tsukemono (pickles) - and enjoying the subsequent health benefits. Wild Fermentation by Sandor Ellix Katz comes recommended by our kimchi sensei. He reports that "It's a little...'wild', but good stuff - anecdotes, recipes, and lore." The web page holds a great load of information including a Troubleshooting Q&A, recipes, and workshop listings for cheesemaking, pickles, and general fermentation. I still have memories of the Korean couple downstairs making kimchi while I was pregnant... it kind of put me off kimchi, although the kimchi stew at Bewon is delicious! One of these days, I might well give this a shot. That's a great story, Jen! I really enjoyed making it. 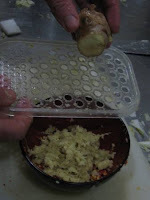 I'd really like to try my hand at making tsukemono (ski-mo-no) using some of the traditional recipes. I'm just waiting for someone susceptible to my offerings of garden vegetables in trade for a lesson and recipe.